This is Knob Creek Single Barrel 9yo. Purchased at Midtown Corkdorks in downtown Nashville about a mile from the Nelson Greenbrier distillery (Belle Meade). Barrel #3422 "hand selected" by the retailer, and they even provided a cool little map of where in the warehouse the barrel was located. Good marketing on their part. What are your thoughts on how much difference the location of the barrel in the warehouse makes? Bottle has been opened for 5 days and is 90% full. Nose: Starts with fruits. Apples, vanilla. Transitions to earthy tobacco, salted "country style ham" and slight bits of smoke and sawdust. Good balance and transition from sweet to savory. Palate: First impressions to myself, and I quote my thoughts, "This is like licking a fresh oak plank thats been covered in butter and toasted." After further examination: Yes, the front end is like buttered, toasted oak. Also get southern style biscuits and a bit of smoke. This transitions to ripe stewed fruits. Red apple, rasberry and blackberry. The traditional bourbony caramel and vanilla are present here with the stewed fruits. There is a tad bit of spicy heat that adds yet another element here. Complex and impressive. Finish: A long, see-saw battle of fresh oak and red apple skins lasting minutes later. Very enjoyable. Overall: I'm impressed by this. Complex, great flavor transitions and balance. I did add water to a small pour but it doesn't do any favors so keep this one neat. This isnt a casual drinker. Savor and inspect this one and give it the time it derserves. Very drinkable at 60%. I have now spanned all of the Knob Creek line-up and this by far and away is the best of the bunch, as expected. I am enjoying this just as much or more as this year's Stagg Jr. At $41.99+tax this is a bargain! Your risk is very low when you know that you already greatly like a bottle from the barrel you are purchasing. It is a very good move. One of the bottles of KCSBR which I own was a gift from my sister. That one was also a "store pick" which happened to have included on the bottle a custom-made attached metal plate 12 year age statement. That's quite a bonus for what is standard as a 9 year old! @casualtorture nice review, I like the descriptors, I really enjoy when a bourbon has those savory or tobacco notes to balance out the sweetness. I agree with @Victor concerning the value of Knob Creek SB, to be able to get a 9-10yr old cask strength (or nearly) whisky for under 45$ is incredible and unheard of in Scotch for example. I am constantly amazed at the store picks y'all have available to you. I have often thought that at those prices I would probably bunker a case for rainy days. Some things are better as an idea. Some things sound great in theory, but don't always pan out in practice. (Insert communism/capitalism/marriage joke here) Knob Creek Single Barrel may suffer from the same trappings. What is Pre-Prohibition Style whiskey? In short: It’s whiskey that refuses to cut corners. But since you’re still here, we’ll give you the longer version. When the Prohibition was lifted in 1933, bourbon makers had to start from scratch. Whiskey takes years and years to make, but the drinking ban was overturned overnight. To meet their sudden demand, distillers rushed the process, selling barrels that had hardly been aged. Softer, mild-flavored whiskey became standard from then on. Full flavor was the casualty. But we brought real bourbon back. Over 25 years ago, master distiller Booker Noe set out to create a whiskey that adhered to the original, time-tested way of doing things. He named it Knob Creek. We age every batch in maximum-char barrels to pull every bit of natural sweetness from the oak. Then we bottle it at an uncommonly balanced 100 proof. Knob Creek is whiskey the way its supposed to be: full flavored. We make every drop count so that you can make every minute count. Without ever having to cut any corners. 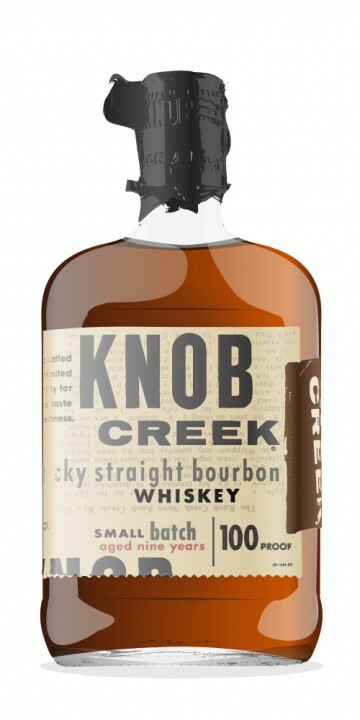 So 100 proof (50% ABV) is the standard for Knob Creek and the Single Barrel offering is a big, bold 120 proof (60% ABV). And while the standard Knob Creek 100 Proof Small Batch has recently dropped the 9 year age statement, the Single Barrel expression still guarantees the whisky is at least nine years old. I was a fan of the 9 Year Old Small Batch and I still enjoy the NAS, 100 Proof version. So how does the Single Barrel taste? Sipped neat, I would NOT have guessed this bourbon to be 120 proof. There is very little tongue burn or "prickliness" to Knob Creek Single Barrel. Adding some water brought out more oakiness, and made the whiskey surprisingly "hotter" and sharper. Drunk neat, the sweetness isn't overbearing or cloying, and it's pushed a bit further back when diluted. But the balance is just a bit “off”. It tastes like a generic bourbon, but with the vanilla and oak a little too prominent in the mix. It isn’t a gentle, floral vanilla either. It tastes a bit like store-brand artifical vanilla extract. Despite the 120 Proof, I prefered this one neat. It's difficult to make any kind of definitive pronouncement on a single barrel whiskey. Each barrel is different, so the next batch could have completely different tasting notes. "Single barrel" is the type of marketing idea that appeals to enthusiasts and purists. But as is often the case, these seemingly great ideas are not without their possible pit-falls. This bourbon was good. Not great, not surprising or incredibly unique. My first impression of it was "This tastes like bourbon". Obvious perhaps, but I was expecting more. Nevertheless, this is a decent product at a respectable ABV. Try before you buy if possible. I love the KCSB, but my first impression was different that yours. I found the rye to be almost too sharp,much less fruity than comparable whiskies. But that sharp rye is what kept me coming back, especially with a few drops of water. I don't see th rye in your tasting notes. Maybe the barrel pick that you ended up with is an outlier? An unexpected irony: When I first encountered bourbons, my first purchase in 2013 was Booker’s and I was thoroughly impressed. Given its scarcity in these parts, sometime in 2014 (I believe) I decided to shore up my holdings with a bottle of Knob Creek Single Barrel. This was to be replaceable, less expensive bourbon to stretch my supply of the “good stuff”. Since that time the KCSB 9 YO has been discontinued in favour of NAS, and though I picked up 2 last year “just in case”, In the past 3 years I’ve accumulated and tasted from at least 7 batches of Booker’s, finished 2 bottles, and some of the ones I bought (in Calgary or US) were cheaper than the KCSB… So much for cheap and replaceable. Not to mention OGD114 which is cheaper, I have more of (though not all here), and I like better. I believe I opened it in 2014. I have progressed through the bottle slowly, gassing each time. There is a little under a third of a bottle left. With water – No change in the nose. Finish: medium sweet on the finish with a hint of menthol. It doesn’t last too long and I get a mild dryness at the end. 21/25 With water, the menthol is slightly more prominent. I like this. If Booker’s or OGD 114 were around (not to mention a BTAC) I would probably go there first. That’s probably why this bottle has lasted almost 3 years and may yet last another 1-2. I think it is more balanced and presents better than the EH Taylor I just reviewed. So if I had to choose one (barrel) of the two, I would choose this one. I really want to try this one. I had a bottle of the standard 9yo and it was decent. I want to see how this one stacks up in comparison. @Nozinan, I am guessing that the substituted NAS Knob Creek to which you are referring is the standard Knob Creek small batch. So far all of the Knob Creek Single Barrel Reserve I have seen still maintains the 9 year age statement. KCSBR can be fabulous. Yes, the barrels DO vary. As @Benancio says, a good barrel of KCSBR can be as good or better than the best batches of Booker's...at a much lower price, so far. @casualtorture, better pick up your bottle of KCSBR before it loses the age statement or the prices go up. I consider KCSBR to be one of the relatively few underpriced whiskies out there. I stocked up awhile ago, with 3 or 4 spares on hand. For value/quality for money in Beam bourbons my suggestions are: Beam Black Label, Baker's, KCSBR, OGD114, OGD100, and Booker's (at old prices). From the folks at Beam, Knob Creek Single Barrel is an example of how a whiskey can be greatly improved by increasing the ABV to near-cask strength. It has roughly the same flavor profile as the standard Knob Creek 9 yo—which, at 50% ABV, isn’t exactly kid stuff—but upping the volume by 10% results in a gutsy wallop of fiery candies and corn. I like the standard 9 yo, but I’ve always found it a little bland on the palate and rough down the gullet. For the single-barrel version, ABV could well stand for Abundant, Bountiful, and Vigorous. I prefer this stuff with a healthy dollop of cool water, although I can take it neat in small sips. Terrific on the tongue when neat, but more complex in the finish with water. Your call. Nose: Fire, cinnamon, and vanilla when neat; water elicits loads of citrus fruits, caramel, honey, and whiffs of leather and rye. The honey overwhelms everything, but nicely so, after a five-minute sit. Palate: Rich, thick, and loaded with corn—all sorts of corn, in fact. Yellow and white corn of the sweet and supersweet varieties and a warm bowl of high-end popcorn as well. (As I live in Valparaiso, Indiana, with Orville Redenbacher’s farmlands just down the road, I know my popcorn.) There’s plenty of quality oak, vanilla, nutmeg, and fresh-from-the-oven peanut brittle as well. It teeters on the brink of over-sweetness, but never goes over the edge. Finish: Long and luscious. Smoky wood, rich chocolate fudge, caramel, rye, and a whisper of mint at the final fadeout. I seem to get a slightly unpleasant note of ethanol with every other sip, but it’s something I never noticed until tonight. Perhaps my tongue is playing tricks on me tonight, but it’s enough to knock a point off my score. Knob Creek Single Barrel has replaced Booker’s as my favorite in the Beam bourbon lineup. It’s a little on the bold side for an everyday bourbon (give me Elmer T. Lee for those purposes), but it’s a fine choice for special occasions—even with its everyday price tag. @WhiskyBee, it is great to see you reviewing again! Welcome home. Personally, I regard standard Knob Creek Small Batch and Knob Creek Single Barrel Reserve to be two entirely different animals. I've found standard Knob Creek to be rather batch variable: some batches have been excellent, others not really very good. Knob Creek is a BATCH WHISKEY, an averaging out of a number of barrels. Knob Creek Single Barrel Reserve, on the other hand, is the best of the best barrels, barrels which are good enough to stand on their own, and don't need to be averaged out for effect. It is always great to drink your bourbon at 60% abv or more, rather at at a lower strength, but the single most important element regarding what makes Knob Creek Single Barrel Reserve great is BARREL SELECTION. My own reviews of Booker's and Knob Creek Single Barrel reflect exactly what you have expressed in your review: I liked my bottle of KCSB even slightly better than my bottle of Booker's. BUT, as an ongoing brand observation I am certain that for me Booker's and Knob Creek Single Barrel Reserve are very close in quality and in my affection, and that which I would prefer at any given time would be determined by the exact barrel of KCSB, the exact batch of Booker's, and the particular mood I am in. Thanks, @Victor. I've been lurking around here regularly, but I haven't participated much because I've not been drinking as much! I'm gradually getting back into all things whisky, however. I finished a bottle of Booker's several weeks ago. Now you've convinced me to buy another one. Like you, my preference for KCSB is slight. I rate Booker's at 90, so I'll gladly put another bottle on the shelf. As many folks who know me are aware of Knob Creek 9 year old is the whiskey that made me fall in love with both whisky and whiskey. It's the spirit that started me on my journey. When it came into Australia I knew I needed to pick up a bottle, and I did, very happily. However the 9 year old single barrel, bottled at 60%, also came in, albeit in extremely limited quantities, I knew that I'd also have to pick up a bottle of this, especially given the fact that all of my American friends were telling me how much better it was then just the normal Knob Creek. A very long day today, spent chatting whisky with newly made friends, and Knob Creek came up. I'd ended 2013 on the 9 year old and after the conversation today I knew I needed to crack open the single barrel. So after a nice hot shower (who the hell takes a hot shower in Perth in the summer?! I mean seriously!?) I sat down to an episode of Justified, one of my favorite new TV shows, pulled up Facebook to do whisky related stuff, and cracked the bottle. Into one of my trusty glencairns it goes, and I give the glass a look and a nose. It's oily, clinging to the glass with thick legs that slowly ooze down, and the nose hits me. It's an aroma that I haven't smelled in forever, but brings back childhood memories. What the hell is that?! Oh that's awesome, and following the buttered popcorn are ripe cherries, red vine licorice and then the buttered popcorn resurfaces. Caramel, Ooodles of vanilla, heaps of cinnamon, rye, nutmeg, brown sugar, maple, the nose is Knob Creek on steroids. It starts off sweet, but as the whisky opens up in the glass the spices really start to shine. Time for a taste though...let's see how the palate holds up. First the buttered popcorn, caramel, charred oak, vanilla, red vine cherries, then heaps of rye and spices, cinnamon and nutmeg, and a hint of leather. Again the whisky starts off sweet then goes quite spicy, especially with rye. For myself the 60% was extremely mellow, with no intense burn. The finish is long, intense, sweet and spicy, and as it tapers off the cherries linger on and on. My friends in the states had informed me that this was by far the better bottling of Knob Creek and I'm pleased to see that they were indeed correct. This is an excellent bourbon, one that I'd love to have on my shelf all the time. Price point runs around $110 to $120 in bottleshops over here, but can be difficult to find as in this shipment into the country there were only 1200 bottles. Now if you'll excuse me I do believe I need another bottle of this. @MCM No batch or barrel code is listed on the bottle. However considering that I've got freshly arrived bottles of both the standard 9 year old and the 9 year old single barrel, cracked open within a week of one another, I can guarantee there is a huge world of difference between these bad boys! The standard is good, the single barrel is brilliant! @Paddockjudge glad to hear someone else has also picked up on the buttered popcorn! It blew me away, so awesomely delicious! Yeah the $100+ price tag and extreme scarcity does make this whisky guy a sad panda. @SquidgyAsh - I know what you mean by buttered popcorn and caramel. I recently had a sample courtesy of @Jonesz - it blew me away! As good as this bourbon is, it brings tears to my eyes when you mention that a bottle is $100+ U.S./CAN. Woah! This is a great experience. I have had Knob Creek Single Barrel ($52/750ml) for the past two nights, and both times about 4oz over a spherical ice ball. The initial nose has substantial alcohol burn (expected at 120 proof) that noticeably tapers off after about 5 minutes and allowing it to breathe/cool off a bit. I find vanilla toffee alcohol to be prevalent on the nose. The first sip smacks you in the face (in the best way possible) and has a warm, cinnamon pepper peanut brittle burn that warms you mouth and chest like one would expect red-hot embers to; this rapidly becomes more subdued and dares you to take another sip. The second mouthful is a bit more tame with the vanilla sweet cinnamon pepper toffee that lingers nicely- the alcohol burn exits fairly rapidly with the flavor lingering endlessly. Exhaling through the nose engulfs your entire head in this flavorful experience. 3rd sip, which is eagerly anticipated, settles you down an comforts you into knowing that there are many more to come. The finish, in my opinion, is much tamer than expected for its strength. The alcohol doesn't overpower the flavor and there is very nice balance. Salivary glands kick into action as you continue to experience the lingering flavors. I am thoroughly enjoying this- Knob Creek Single Barrel reinforces why (we) drink bourbon. It is challenging, bold, satisfying, balanced......awesome. My bottle did not have a barrel or lot number on it and I paid $32 for it in Chicago. I have seen private barrels from Binny's with barrel info on it just not the standard single barrel bottle. Great bourbon, one of my favorites at this time. Just got my first bottle of this a few weeks ago - I agree with your "woah!" I've always liked standard Knob, but this just outclasses it handily - easily worth the extra $10 (esp. since I've been adding a touch of water to bring the proof down a bit - get an extra glass or two our of the bottle). The added richness here brings it into better balance with all the oak than standard Knob. I'm glad we're starting to see more of these single barrel offerings from bourbon producers. This one happens to be bottled from barrel #59, not sure how much they'll vary by barrel. Added a teaspoon of water. Knob Creek was the first whiskey I really took a shine to, so I was excited at the prospect of a new version. This single-barrel expression is also aged 9 years and bottled at 120 proof. After adding some water I put my nose up to the glass, trying to pick out specific aromas from the general "bourbon smell". The first impression I got, strangely, is of a musty cellar. Deeper in the glass there are sweet spices and that old smokey leather smell. Very rich, deep, expressive. Hot and oily. After a few minutes in the glass some lighter floral notes start to develop. Becomes sweeter and less musty. Very nice. It prickles the tongue with cinnamon heart flavour, then that earthy/vegetal note that made me think of cellars. Robust and mouth-coating. Nice development from spicy to sweet to oaky. The finish is incredibly long and maintains all the flavours, leaving a lasting impression. Overall I'm thrilled with this whiskey. It is fun to sip at full strength and feel the burn but it really shines after a bit of water is added. Tastes a touch more refined than the Small Batch version to me. I've always enjoyed the standard KC 9 yo as a nice sipper at a restaurant (not too complicated, but a pleasing profile that is smooth and sweet, but not boring) when I have been in the US. I'm crossing fingers that the Ontario inventory of the KCSB holds out until I can pick up a bottle in the near-ish future. Over the last few months, I have tasted Baker’s, Booker’s, and Knob Creek Single Barrel alone and against one another in order to discover their commonalities and their distinctions. The differences among them are subtle, perhaps more so than I would like; still, each is quite good. I reviewed Baker’s some time ago (connosr.com/reviews/bakers/…), and here I review Knob Creek Single Barrel. The nose has a deep note of cocoa overtop of cherries, peppermint, and cinnamon. It is oaky, yeasty, and buttery. Altogether, it is something of a sweet-and-savory dessert. The palate is slightly astringent, hot, and spicy, with orange peel, chocolate, banana, and a streak of molten cinnamon running through its core. If Baker’s is the cashew brittle and Booker’s the candy bar of the trio, then Knob Creek Single Barrel is dark chocolate. It is dry and deep, slightly bitter and subtle. @Benancio, I've only owned one bottle of the Knob Creek Single Barrel Reserve, which was really excellent. I've tasted several batches of Booker's, including the Booker's 25th Anniversary Limited Edition. In general I rate Booker's and Knob Creek Single Barrel very close to one another in points. The KCSBR I've had has been a little more dense and lush than the Booker's (it is aged 9 years, compared to 6-8 years for the standard Booker's), but I can't say that I've sampled more than that one bottle. I think that the definitive comparison would depend upon the specific batch of Booker's or the specific barrel of Knob Creek SB Reserve being sampled. That said, Booker's is at a little higher ABV, which I like,...BUT, Knob Creek Single Barrel is, at US domestic prices, a steal of a good deal for the money. Really I think that on average KCSB will be the equal to Booker's, but that it is more likely that there will be a lesser barrel of KCSB once in awhile than that there will be a lesser BATCH (easier to blend to style)of Booker's. I think that it is hard to go wrong with either one of them. @Robert99 and @Benancio, yes, Knob Creek Single Barrel Reserve and Booker's should be both from just the same grain mashbill. I expect that the yeast used is just the same here, as well.